My nickname is not poop! "Its funny because its bigger than a normal hat." Pablo, feel free to add this to the FAQ section. Whether you frequent the race track or just enjoy the twisty back roads, swapping to a stickier tire is arguably the best modification you can make to your motorcycle. While there are a few good tires available to fit the GS500, most manufacturers only offer their stickiest tires in wider sizes. The factory GS500 wheel is 3.5” and can accept 130 or 140 rear tires. Some people have tried to fit 150 rear tires but most report that the handling doesn’t feel “balanced” and that the bike seems less stable in the corners. This is because the skinny rim pinches the tire, altering the tires profile and making the edge of the tire very steep. The obvious solution to this situation is to buy a new bike. Kidding! Getting a wider rear wheel will allow the fitment of bigger tires. A 4.5” rear wheel will fit in the factory swing arm without serious modification and will allow the fitment of a 150 or 160 tire. Many have reported using the 1988-1989 GSX-R 750 rear wheel, but they are wider at the axle and the wheel bearings are the wrong size. While doable, this makes the installation a bit complicated. In comes the 1998-2002 Suzuki Katana GSX600F and GSX750F. Both of these bikes have the same rear wheel and it measures 4.5” wide. Conveniently, nearly all dimensions of the wheel are the same as the factory GS500 rear wheel. The GS500 sprocket hub and cush drive fits perfectly into the Katana wheel. The axle on the Katana has the same diameter as the GS500 axle, so the bearings are the correct size. The axle width of the Katana wheel is also the exact same as the GS500 wheel. 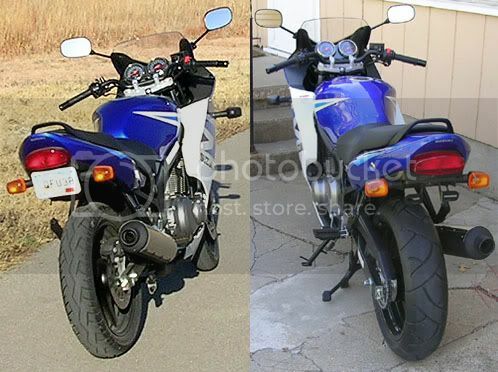 Simply put, a 1998-2002 Katana rear wheel and brake rotor will directly swap into a GS500 with few modifications. Unfortunately, the Katana wheels have a “straight spoke” design and the GS500 wheels are a “twisted spoke” design. This means that the front and rear wheels will not quite match if the Katana rear wheel is used. See the pictures at the end of this article and judge for yourself. Since much of the rear wheel can not be seen, it is very hard to see the difference and it’s really not an issue. Since the GS500 brake rotor is a 4 bolt pattern and the Katana has a 5 bolt pattern, the Katana brake rotor must also be used. The rotor diameter is only a few millimeters smaller than the GS500 rotor so it will work with the GS500 caliper and caliper bracket. Keep an eye on your brake pads, over a few years you might see uneven wear. The pads should be replaced if the uneven wear becomes excessive. There are a few minor issues with getting the tire to fit. 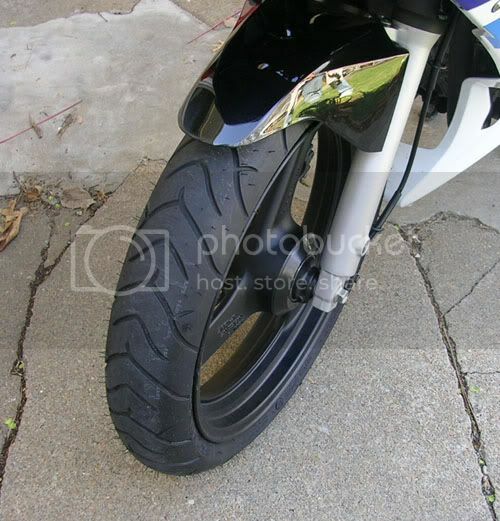 I will now explain each step I took to fit the Katana wheel and a 160/60 ZR17 tire on my 2005 GS500F. First, I found a 2002 Katana wheel and rotor on Ebay. I paid $140 shipped and the wheel included the wheel bearings and valve stem. Be sure to check the bearings before installing the wheel, mine were in bad shape and I had to replace them. Here is the Katana wheel installed to check clearance. 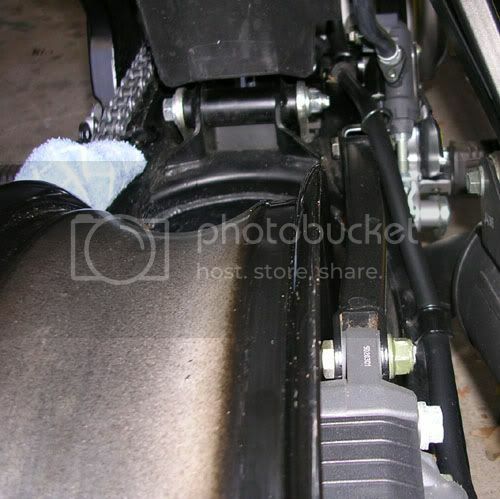 The brake torque rod connects the brake caliper to the swing arm and had to be bent. The rod would have interfered with the wider tire by nearly 1/4”. The brake torque rod is made out of 1” steel square stock and is very strong. I had to heat it up with an oxy-acetylene torch and use a shop press to bend it. Before I did anything to it, I traced its shape onto a piece of paper because I did not have the bike with me to test fit. This gave me something to compare the bent rod to so I would know when I had bent it far enough. Naturally, the torch burned the paint off so I used Plasticote flat black engine enamel. The finish and color is surprisingly close to the factory paint. Here is a picture of the bent torque rod around the 160/60 ZR17 Metzeler Sportec M-1. The next issue to address was the drive chain. According to my measurements, if everything was left in stock form the chain would clear the 160 tire by 1/16”. At least 1/8” clearance is needed on all sides of the tire for safety reasons, so this was not acceptable. To fix this problem, I decided to put washers between the sprocket and the sprocket hub to shim it out just under 1/8”. Any washer will work, I used 5 (one for each sprocket bolt) of the appropriate size and I measured each one with a caliper to ensure that they were close to the same thickness. I suggest bringing a sprocket bolt to the hardware store to help find the appropriate size. The sprocket hub has a machined lip protruding out it that fits inside the center of the sprocket. This lip keeps the sprocket centered on the hub, and takes a good portion of the force exerted by chain tension. 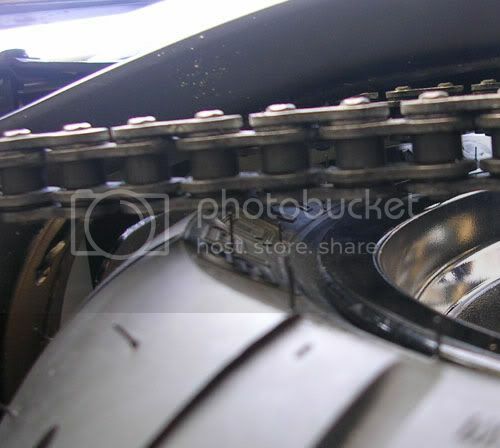 It is extremely important to note that if the sprocket is shimmed out too far, these two surfaces will not make sufficient contact and the sprocket bolts will be forced to carry all of the force exerted by the drive chain. They were likely not designed for this and this situation could cause catastrophic failure and is extremely dangerous. The last step is to trim the chain guard. It only needs to be trimmed about 3/16”. I used a Dremel. I suggest saving this step until the wheel has been installed so that the guard is trimmed in the right location and the right amount. 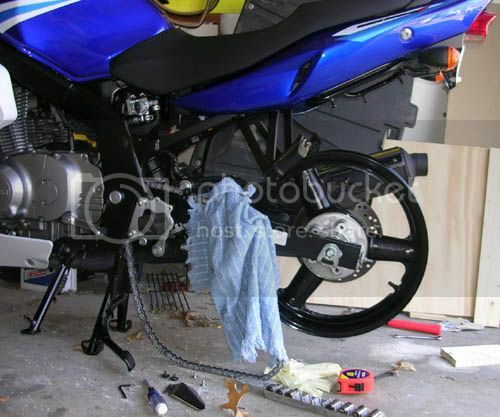 Once the brake torque rod was bent and the sprocket was shimmed I installed everything into the swing arm using the GS500 sprocket hub, brake caliper bracket and all spacers. Everything fit great and I had well over 1/8” clearance on all sides of the tire. This picture is an attempt to show that the chain clearance was almost 1/4”. Here is the trimmed chain guard. Please excuse the mess, the bike was in need of a good wash.
After a test drive and rechecking the torque on all bolts, all seemed well. In about 1 hour I had successfully mounted a 4.5” wheel and a 160/60 rear tire with no serious modifications. I also changed the front tire to a Metzeler Sportec M-1. The factory GS500 tires are bias-ply and the M-1’s are radials. Never mix bias-ply and radials, it is highly dangerous. Here is the new front tire. As stated before, the front and rear wheels are not quite the same design. Here is a picture that shows how close they are. No biggie, right? Here is an attempt at a before and after shot. Please perform all modifications safely. Consult a repair manual and do not hesitate to ask a professional if you are unsure of anything. Doing any kind of work on wheels and suspension can be extremely dangerous if not done correctly. Work smart and check your work many times. GStwins and the author of this article are not responsible for any injuries or property damage that may result from attempting to modify your motorcycle. This is not meant to be a complete guide for those that have never worked on motorcycle suspension and driveline, but rather an informational guide to those that have experience and knowledge of such systems. Ride safe and ride smart. 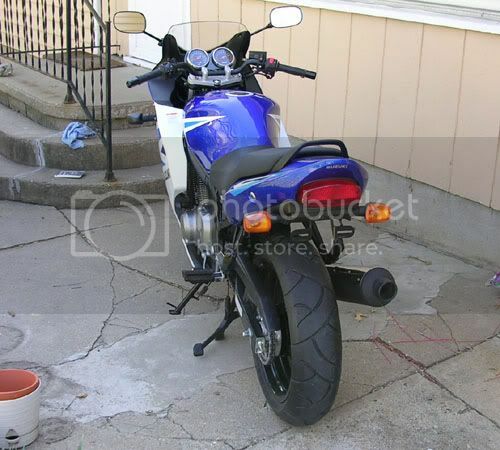 ..:: '05 GS500 :: Hindle Can :: Kat rear wheel :: Kat Shock ::..
..:: Fairingectomy :: Never been laid down mod ::..
wow! good job!!! now question, when riding the bike, have you noticed and diference in handling? is it still as "flickable" as it was before? Difference in handling? Dear God, yes. I got the tires scrubbed in last night and this morning. A friend and I hit the twisties around dinner time tonight and I was blown away by these tires. Yes, naturally there was a difference in handling. On my test ride I was taking things VERY easy, as new tires are as slick as snot. Turning at low speeds took a little bit more input, but nothing major. After the first few turns I am now used to the handling and don't even notice the difference anymore. When I was doing some "spirited" cornering tonight the bike might have taken a *slight* bit more effort. It really wasn't noticeable, it could have all been in my head. Even if it does take more effort, the difference is minimal. The bike felt more stable tonight than it ever has. 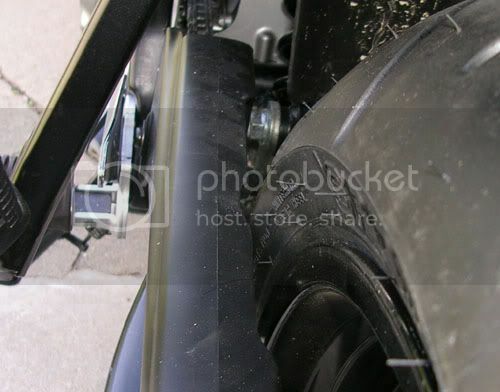 This could be a result of the new sticky rubber or it could be the wider tire. Likely, its a combination of the two. I love it, deffinately some of the best $350 I've ever spent. I never got nerdy enough to weigh the old wheel/tire combo versus the new wheel/tire combo. Just by picking both up at the same time, the Katana wheel and 160 tire are a little bit lighter than the GS500 wheel and 130 tire. This is because the new wheel really is quite a bit lighter than the GS500 wheel. 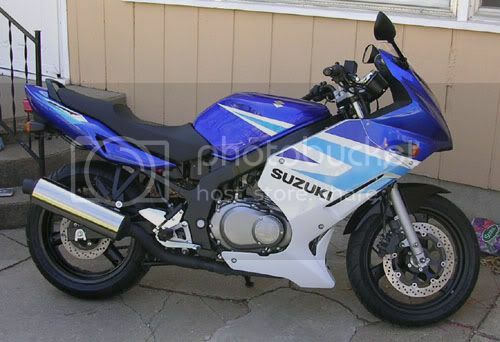 Don't get me wrong, it's a small difference and you wont notice anything on the bike. Very nice job TF. Only thing I was wondering about after reading was the alignment of the front/rear sprockets. You made no mention of moving the front sprocket outward to match the rear sprockets move outward. Maybe I missed it. Be good to look at the insides of the chain side plates for unusual wear indicating side loading of the chain if the front sprocket wasn't moved. Indeed, I did forget to mention sprocket alignment. I only moved the rear sprocket outward just over 1/16", and I did not move the front sprocket at all. The chainline on this bike is approaching 2 feet long. I honestly believe that there will be no adverse effects from the chainline changing 3/32" over 2 feet. Never-the-less, I will be keeping an eye on chain/sprocket wear. Great write-up TD. Thanks for taking the time. I wish someone had done this write-up when I had my gs as I would have ended up doing it instead of buying my 600rr. Wait, maybe its better no one did it...LOL. Any reason why this got moved to the "Test Area" forum? Pandy hates you. We all do. We just didn't want to tell you. Nope. It's moved so I can make comments about tire sizes! It should be noted that tire sizes vary widely among manufacturers, as well as between two different tire models. A 160 series tire may not be 160mm wide with every manufacturer. Also, the profile of each tire can vary widely depending on which style of tire (sport, sport touring, etc) you are looking at, as well as the manufacturer. Some tires have a more pointed profile making for sharper turn in, while others have a broader and flatter profile for stable highway cruising and smooth, predictable turn in. From personal experience, I can tell you that a Dunlop D208ZR in a 160 rear (the lowest size availible) will NOT work with the Katana wheel swap. Here is a list of tires that come in a 150 rear AND a 110 front. Some 160s may fit, but it is very dependent upon each tire (i.e. the Dunlop D208s do not work, but the Metzler Sportec M1s do). Since some 160s do not work, I am only listing the 150s. Also, I am omitting tires that have an option for a 130 & 140 rear, as that would defeat the purpose of doing a wheel swap. Good call. 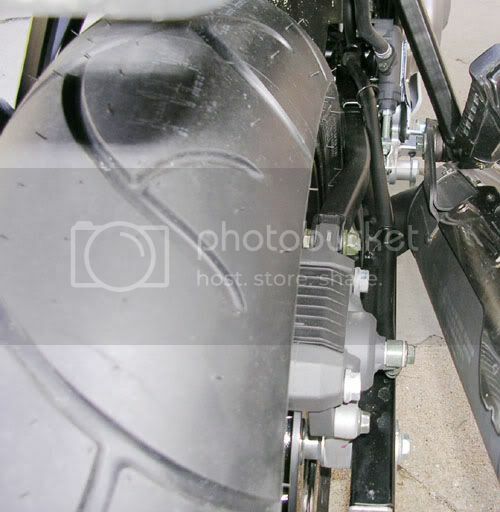 As can be seen in the pictures above, the Metzeler Sportec M-1 I used had a very pointed profile. The outer 3/8" of tire was physically impossible to reach. My next rear tire will be a flatter profile and will likely be a 150.